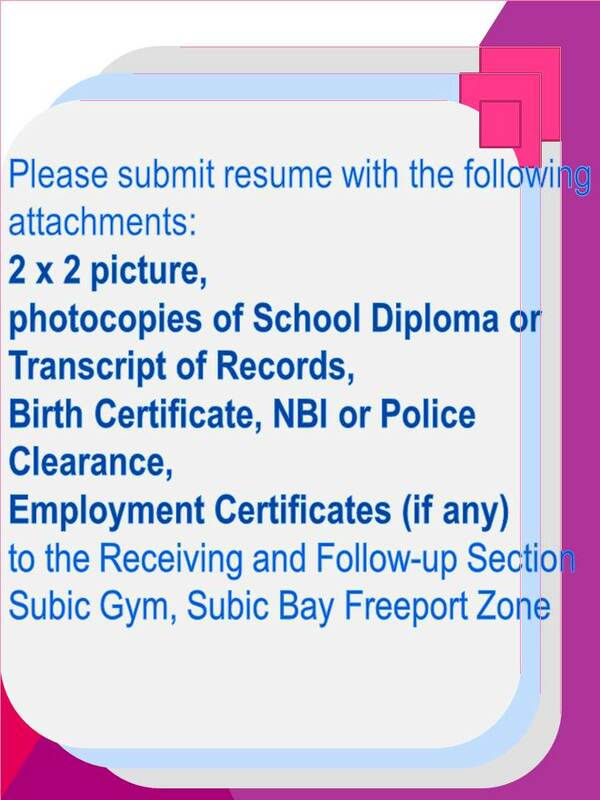 Candidate must be a graduate of BS in Accountancy; With at least 1 year of relevant work experience; Must be capable of utilizing automated accounting system; With knowledge of the current Philippine accounting standards and BIR regulations; Must be well-acquainted with various business documents; With broad knowledge of accounts payable and accounts receivable; Must be highly organized in preparing, sorting and safekeeping of routine administrative paperwork; Has excellent analytical, and verbal & written communication skills; Must be proficient with MS Office programs, primarily MS Excel and Word; Can work under pressure and with limited supervision; Must be willing to travel and work overtime. Male, at least 23 years old; With relevant short-course certificate, or at least high school graduate with equivalent experience; With experience in the specified position; Can communicate in English language, both verbal and written; Must be hardworking and responsible; Can work accurately under pressure and with limited supervision. HYS-YACHT PHILS. LTD. CO., INC. Male, 25 to 40 years old; Preferably with relevant TESDA training/certificate; With relevant work experience; Must be of good moral character. Male, not more than 40 years old; Must be a Registered Mechanical/ Electrical Engineer; With at least 5 years of experience in engineering and maintenance on a supervisory capacity; With relevant experience in hospitality industry is an advantage. Male, not more than 40 years old; Graduate of Culinary Arts or other 4-year courses; With at least 5 years of experience as Head Chef in a fine dining restaurant. Male, not more than 35 years old; Must possess an associate/bachelor’s degree in Hotel & Restaurant Management; With at least 1 year experience in similar role; Must have attended the Basic Life Support, First Aid and Adult CPR trainings; With Basic Water Safety Training is an advantage. Male/Female, not more than 25 years old; Graduate of BS/Associate in Hotel & Restaurant Management; With at least 6 months of relevant work experience. Female, not more than 25 years old; Graduate of BS in Tourism or Hotel & Restaurant Management; With pleasing personality; Has good communication skills; Must be computer literate. Male/Female, not more than 30 years old; Graduate of BS/Associate in Hotel & Restaurant Management; With or without work experience. Male/Female, not more than 30 years old; Graduate of BS/Associate in Hotel & Restaurant Management; With or without work experience; With driving skills is an advantage. Male, not more than 30 years old; At least college level; With at least 1 year of relevant work experience. Male, not more than 35 years old; Must be a Licensed Mechanical or Electrical Engineer; With or without experience. Male, not more than 35 years old; Graduate of at least any relevant vocational/technical courses; With at least 1 year experience in the same nature of job. Male, not more than 25 years old; Must be a graduate of BS in Hotel & Restaurant Management; With at least 1 year of bartending experience; With skills in preparation of drinks; Must be customer service-oriented. Male, not more than 35 years old; At least high school graduate or college level; With at least 1 year of relevant work experience. Male, not more than 30 years old; At least high school graduate or college level; With at least 1 year of relevant work experience. Female, not more than 30 years old; Must be a graduate of BS in Criminology; With experience in similar role is an advantage. Male/Female, at least 20 years old; At least high school graduate; With at least 6 months of experience in similar job.